Description Due to the fact that it’s narrow in the city, many people still live without elevator. are two tubes beside the head tube , which larger the area where your shoulder and the bike contact. The cap on the headset stables the stem, and keeps it from turning for the most stable position. 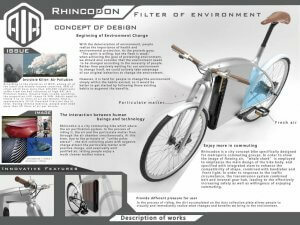 Description Rhincodon is a city commuting bike which educe the air purification system. attract”, the dirt collecting plate with negative harge attract the particulate matter with positive charge, and eventually emit purified air, letting people enjoy a much cleaner mother nature. (1) Break the rear wheel first then the front wheel, and the time difference is less than 1/10s. 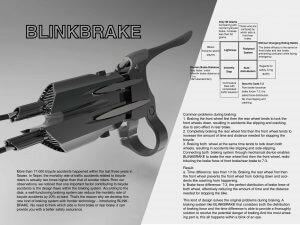 This prevents the front wheel from locking down and accidents like crashing from happening. (2) Redistribute the brake force of front brake/rear brake to 7:3,the perfect distribution of brake force of both wheel, effectively reducing the amount of time and the distance needed for stopping the bike.This kind of design solves the original problems during braking without changing your riding habit. 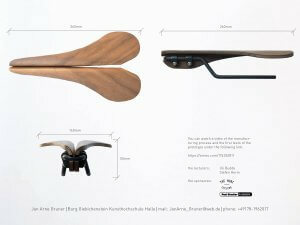 and increase durability.FLY is assembled from two wings made of engineered wood. 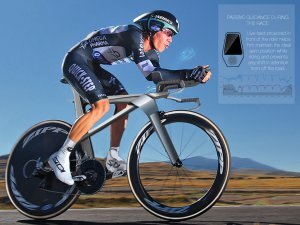 The material is made more durable by adding two layers of carbon fibre underneath the surface layer.As FLY is constructed of two independent wings it is able to follow the natural movement of a cyclist’s legs and hips. The surface can be made from a broad variety of materials, like different veneers, paper or fabric. So the product can be adapted to the consumer. Description The Interpolate XC bicycle utilizes a patent-pending steering system which ergonomically accommodates large bicycle wheels. To prevent toe collision and preserve contemporary 29er XC geometry, the handlebar sits inside the main frame. Steering input is indirectly translated to the fork via a pair of cogs linked by a chain. The steering sensitivity can be fine-tuned by altering the size of these cogs. Description Kanguru is a bicycle concept that based on bicycle messengers and how they use their bicycles in order to deliver packages and mails. 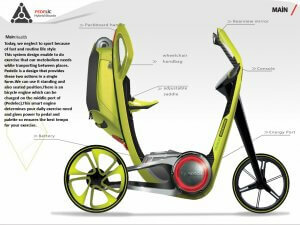 With this design concept the aim was to create a specialized bicycle on bicycle transportation. An A3 sized mail box is placed in the center of the frame. So mails are secured from external factors. Oversized packages are also placed center of the frame. Elastic straps hold the package no matter what their size is. The bicycle is boosted with an electric engine in order to help the user with the ramps. Description Think about two different design styles are uniting in one case. Strength of the hands is supporting the power of the legs and two people are coming together for one purpose. 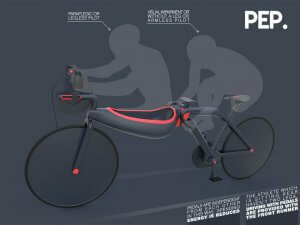 PEP brings a new wave to the games by the light and innovative design, and proves that disabilities are not barriers for the love of bicycle. 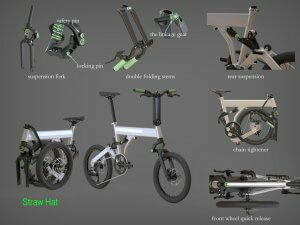 Description The Straw Hat is a kind of full suspension folding bicycle with off road performance. 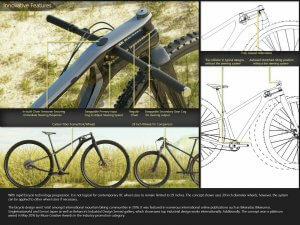 It achieves longitudinal folding of front fork and back triangle through shared pivot. 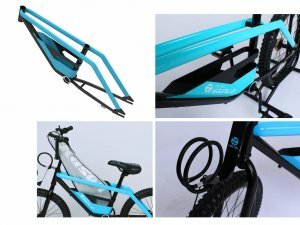 “shared pivot” and double folding stem technology with combination of suspension principle can satisfy the requirements of off-road as well as realizing the features of compactness, neatness and portability after being folded. Additionally, as a folding bicycle, it is also very nice for daily riding. 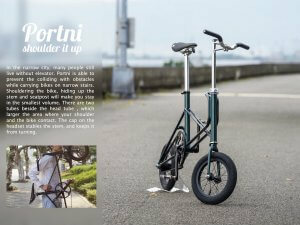 Description The purpose is to design a bike that is consistent with the characteristics of the boy of the age. Boys can take most sports goods out in this bicycle, such as football, Ping-Pong, badminton, kite. 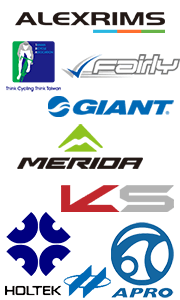 The bicycle save boys energy when boys leave for sport space with sports goods, because they can put sports goods on the bicycles. The bicycle is to create a better sports experience for boys. Description The goal of Aeroblade is to provide two sitting positions for road cyclists to manage their performance better in order to fully engage in cycling to challenge themselves, get stronger, faster and ride longer without any concern. 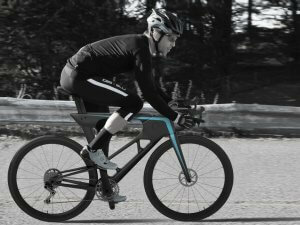 Description The intent with this bike was to aid the rider while racing as well as training. decisions during the race with the information that is available to him and does not have to rely on radios and other outside sources to take his decisions. 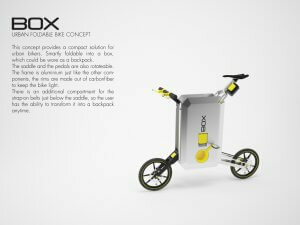 Description This concept provides a compact solution for urban bikers. Smartly foldable into a box, which could be worn as a backpack. The saddle and the pedals are also rotatable. The frame is aluminum just like the other components; the rims are made out of carbon fiber to keep the bike light. There is an additional compartment for the strap-on belts just below the saddle,so the user has the ability to transform it into a backpack anytime. 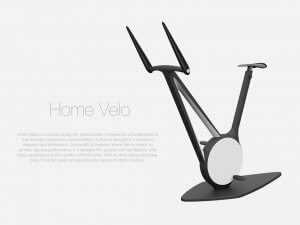 Description Home Velo is a concept design for exercise bike. 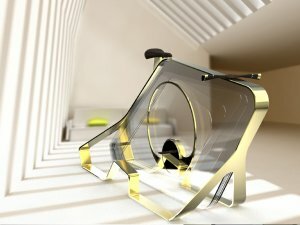 It represents a combination of functionality, ergonomics and aesthetics. Its form is thought in a matter of elegance and minimalism. Mobile and static handles, in addition to adjustable seat, allow different positions while training, and also suit well to every user. Along with its magnetic resistance, Home Velo is meant to provide upmost performance. It is designed for people with fast lifestyle, who enjoy working out in the comfort of their home. With its sleek design and clear lines, it can be easily incorporated into various modern interiors. 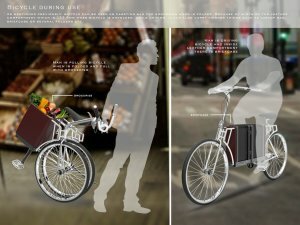 Description Marsupial is the foldable city bike, not only does it serve as a vehicle but it can also serve as carrying bag when folded. Intended for those who prefer bicycle as a mean of transportation when going to work, it has to offer even more than just that. While observing human routines I realized that people often visit grocery stores after work. With Marsupial people will not have their bags hanging on the steering wheel since it can make driving difficult and cause accidents. It will provide safe transport for people and also for groceries. 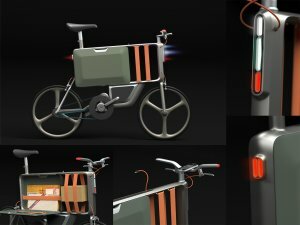 Groceries will be put into the folded bicycle and like that will be transported ome. Marsupial has simple design; in accordance with purpose it’s a bit vintage. 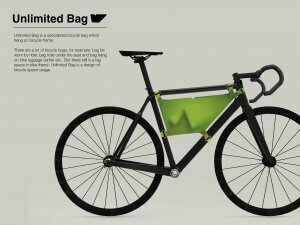 Bicycle frame is made of aluminum, while bag is made of leather. Bicycle is lightweight, and folding is fast and simple. 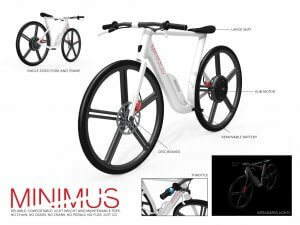 Description The MINIMUS: flyweight electric bike has the potential to start a new category. in a local bike share program. Not everyone owns a bicycle because they love to pedal, MINIMUS is for those who just want a fun and easy way to get around. Description Today, we neglect to sport because of fast and routine life style. be charged on the middle port of (Pedelec).This smart engine determines your daily exercise need and gives power to pedal and palette so ensures the best tempo for your exercise. processing the technical collaboration agreement with specific company, and we will announce it with the mature cooperation in avoidance of any dispute. using the Rebell super easy. Description Shard is a cycle trainer that transforms from a functional object to an artistic light installation when not in use. Shard creates an immersive experience through haloed lighting around the cyclist. Moving away from the prevalence of biofeedback interaction design based on screens and numbers, Shard influences behavior through ambient light and does not demand direct attention for consumption of information. 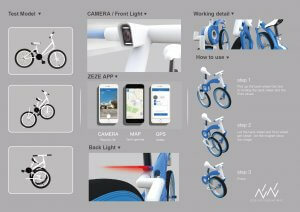 Shard has two working modes: cycling mode and standby mode, in both the modes Shard gives ambient light based on input taken from sensors on the bike or data from the app. 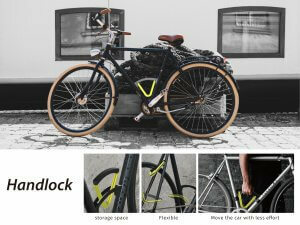 Description Unlimited Bag is a specialized bicycle bag which hang on bicycle frame. Description ZEZE is a foldable bicycle that especially designed for children. Unlike other similar products on the market, ZEZE’s folded volume can be greatly reduced to fin in any trunk effortlessly. Equipped with 16-inch wheels, ZEZE makes a very safe and highly portable bicycle that is suitable for kids between 3 to 7 years old.